To improve the security of Chrome browser and stop 3rd party Extension, Script installation this is new security feature added by Chrome team.You can read about it here. It may be annoying for power internet users, but for a normal user this is indeed one of the useful security feature added by Chrome. As, any 3rd party websites can prompt users to install extensions, scripts and it may lead to security leak of your system. Though, I’m sure many of you who all are fan of Greasemonkey scripts or like to install extensions from 3rd party Websites, they don’t want to be stopped by this security measure and looking a way around to install 3rd party extension. Here in this article, I will share how you can install 3rd party Chrome extensions outside of Chrome store. As I mentioned above, Chrome now let you install extension directly from Chrome Web store only and to install 3rd party extension, here is a quick work around. The solution is pretty simple and all you need to do is, download the 3rd party extension, greasemonkey script or any other script that you need to install. 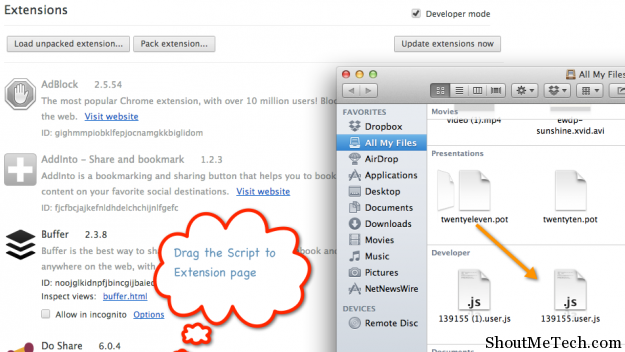 Once you have downloaded the script or extension that you need to install, simply go to the extension page of Chrome and drag and drop the extension or greasemonkey script you need to install. Go to this Chrome Extension page. Open the folder where you have downloaded greasemonkey script. Drag and drop the script and your script will be installed. I have tried and tasted this by Installing greasemonkey extension and it worked fine. This trick will also work for any 3rd party chrome extensions outside Chrome Web store. Another work around to install and manage greasemonkey user script in Chrome browser is by using TemperMonkey chrome extension and it will work great too. If you still face any problem with Greasemonkey script installation in Chrome browser or installing any 3rd party Chrome extension, do let me know via comment. You can also join us on Facebook for instant updates.